Taxis and busses take you from the airport to the Coach Station of Halkidiki (KTEL) in Thessaloniki. There you can take the coach to reach the destination of your choice. By train: There is no train network in Halkidiki. Travellers coming by train from other parts of Greece or from abroad arrive at the Train Station of Thessaloniki. After arriving at the Train Station of Thessaloniki, take a taxi or the bus to reach to the Coach Station of Halkidiki (KTEL), in Thessaloniki, and then take the coach to reach Halkidiki. 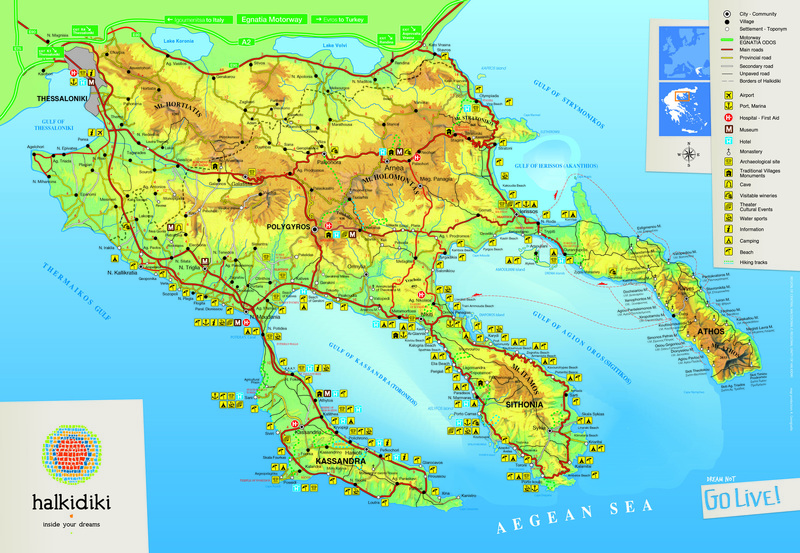 By coach: All the villages and the beaches of Halkidiki are connected by coaches to Thessaloniki. There are buses that run daily and several times per day, throughout the year. By car: The Egnatia Motorway (Egnatia Odos), which crosses Greece from its westernmost edge -Italy (Igoumenitsa)- to its easternmost borders with Turkey (Kipi, Evros), is a modern motorway of international standards, equipped with devices and safety systems that aim at protecting and helping the motorists. Egnatia Odos meets the Ring Road of Thessaloniki which leads to the National Road towards Halkidiki. -From Italy: Igoumenitsa –> Egnatia Odos Motorway towards Thessaloniki.